Greetings. I hope this issue of Holsten Galleries News finds you and your loved ones well. This month I am featuring works by several of my favorite glass artists. I also want to honor Marvin Lipofsky whom I have represented for over 30 years and who died last month. I look forward as always to any questions or comments you may have. 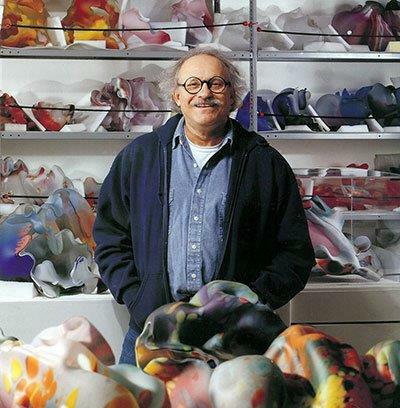 California glass artist Marvin Lipofsky died on January 15 at the age of 77 after several years of failing health. I first met Marvin in 1983 when he traveled to the opening of his one-person exhibition at Holsten Galleries-Palm Beach (1980-1990). Marvin was one of Harvey Littleton’s first students in the new glass program at the University of Wisconsin-Madison in the early 1960’s. 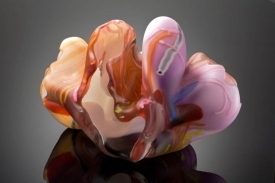 He founded glass programs at the University of California-Berkeley and the California School of Arts and Crafts (now California School of the Arts), and traveled and worked in over 20 countries, pursuing his passion for creating glass sculpture. His works are abstract, organic and fluid. 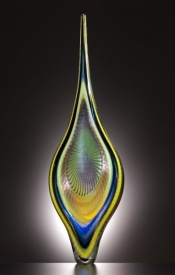 Marvin will long be remembered as one of the pioneers of the studio glass movement. San Jose Group #3, 11" x 17.5" x 11.5"
35.5" x 10.5" x 6.5"
Recently I was able to add this beautiful example of Lino’s Bilbao series to my website. I love the shape of this piece, the various styles of surface engraving and also the subtle cane work. Lino’s selection of colors here makes it all the more dramatic. Here is the latest addition to my inventory by Nancy Callan. The form is typical of her Cloud series: fluid, puffy and curvaceous. In other words, cloud like! The color combination in this piece is quite unique and the swirly cane work is some of the finest I have seen in Nancy’s work. Sentinel, 28" x 11" x 11"
So many of you admired "Splash" by Harry Pollitt in last month’s newsletter that I have decided to feature another piece this month. 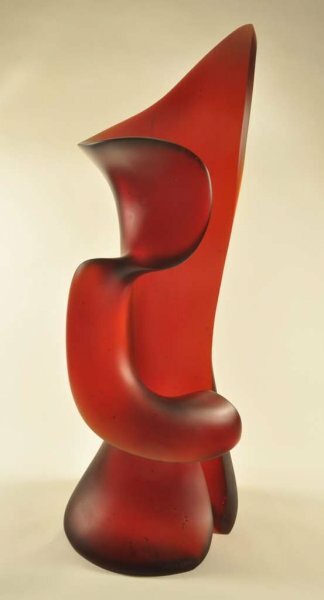 As in all of Pollitt’s glass sculptures, "Sentinel" is graceful, fluid and abstract. The use of the lost wax modeling and casting technique give the artist the ability to manipulate the form and use negative space in a way that would not be otherwise possible. What a striking piece Sidney Hutter has created here! The movement in the form, the dramatic use of purple and red and the optical effects all combine to make a piece which is truly exciting to gaze at. 16" x 9.25" x 9.25"
This is one of the finest pieces I have seen by David Schwarz. The shape is lovely, the colors subtle yet strong and the visual effects are dazzling. For me it is easy to get pulled into the interior of this piece which seems to be its own microcosmic universe. 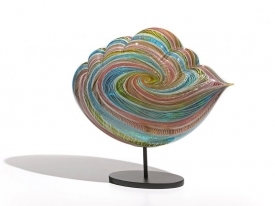 I hope you have enjoyed viewing this month’s wonderful glass sculptures. I look forward to staying in touch!